Mario Batali is a New York icon, even though he’s not actually from the Big Apple. He has built an international empire based around his love of classic Italian cuisine. After studying for a while underneath the inimitable Marco Pierre White and The Four Seasons Hotel chain, he chose to leave a promising career to move to the small Italian village of Borgo Capanne to get back to basics. It was here that he honed his skills, learning to press olive oil and celebrating fresh, seasonal ingredients. His food philosophy mirrors that of his rustic roots; do as little to the raw ingredients as possible, just enhance their flavour. In recognition to his contribution to New York cuisine, both with his restaurants and his Italian grocery empire (Batali is also co-owner of the ultimate homage to Italian food Eataly), the Walks of New York has built a walking tour about Italian cuisine in Greenwich village that is centred around Batali. As a lover of Italian cuisine, my tastebuds were delighted to be invited to experience this tour. I went in not quite sure what to expect. To be honest I knew only a little about Batali, having lived in what seems like a culinary bubble in Mumbai, I have felt disconnected with the international food scene. I was pleasantly surprised to find that this tour is not just about one man, but rather follows the migration and settlement of millions of Italians who came to New York in search of a better life. According to tour guide and co-founder of the Walks of New York, Jason Spier, a staggering 4 million people emigrated from Italy to New York between 1880 and 1920. A significant population settled in the less affluent area known as Greenwich village, named by the English to reflect the sleepy farming village that it then was. A hundred years earlier the local Indian population grew tobacco here, but it wasn’t long before the new immigrants made themselves at home. Catholic churches sprung up and local delis began selling ingredients and creations from home. Some of those original stores still remain today due to the wise investment of ancestors who purchased their shop-fronts, thereby avoiding the now prohibitive rents, according to Spiers. These family owned businesses form part of the tour, from the butcher that is famed for creating it’s own cut of meat, to those who have been making fresh and dried pasta for over 100 years. More than just an exploration of places, the tour takes one on an educational journey of Italian food and the locality. Over three hours I learned about how olive oil is made and what the real difference is between virgin and extra virgin oil, all taught through a tasting of oils (my waistline is still paying for this!). Similarly, I learned about balsamic vinegar and it’s humble beginnings in medieval Italy. Along the way, we passed Jimi Hendrix’ old recording studio, stood where Bob Dylan shot the cover of The Freewheelin, saw where Edgar Allan Poe explored his fascination with death and learned how Washington Square came to be. The depth of information and the guide’s clear knowledge and understanding of Greenwich Village made this a tour I wouldn’t hesitate recommending. Then of course there was the food. The tour covered several eateries, most that had been stalwarts in Greenwich for generations, as well as two of Batali’s restaurants. For me there were several highlights, the first being the delicately flavoured lemon tagliatelle with carrot at Pagani. As owner Enzo proudly talked about his Sicilian heritage and the restaurant’s philosophy of serving not only fresh but also humanely treated meats, we sampled cured meats and a chick pea and celery root bruschetta for me (as I don’t eat red meat or pork) and of course the tagliatelle. The citrus infused pasta was al dente and a celebration of the Sicilian love of the lemon. Perhaps I’m a little bias, as after several trips to Italy, Sicily is my favourite culinary region. While the restaurant stays true to its roots, Enzo explained that they’ve adapted to the needs of a discerning New York clientele, and now serve house made egg-less pasta, vegan meals and even gluten free pasta (that took over 6 months to perfect to the Chef’s exacting standards). I’m hoping to fit in another meal at Pagani before leaving the Big Apple. At Batali’s Otto Restaurant we had a rustic selection of salads and bruschetta. 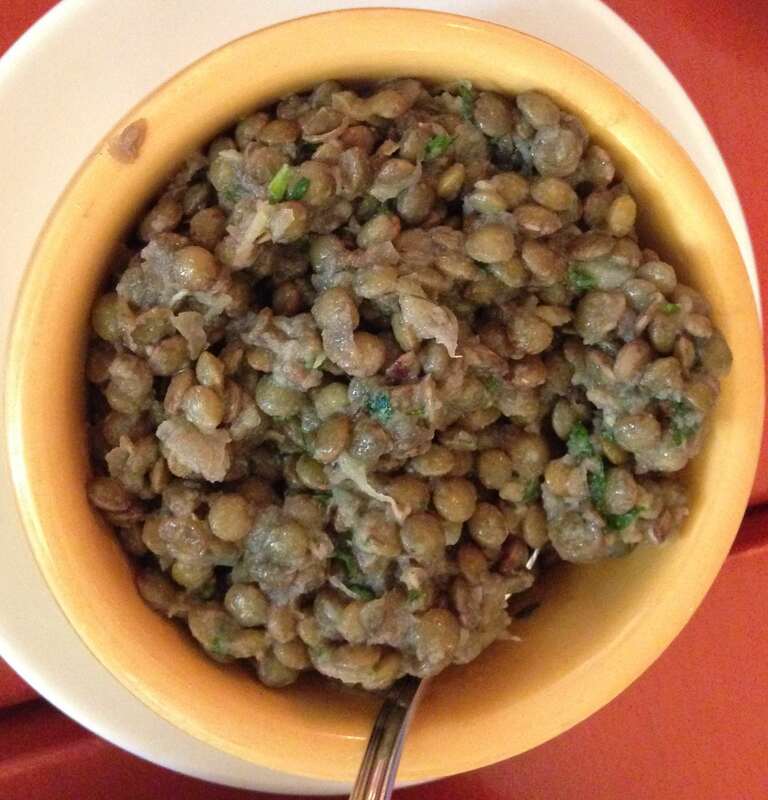 For me the dish that I would go back for would be the lentils. A far cry from the dal chaval I’m used to in India, the puy lentils were plump and firm and marinaded in a subtle wine vinegar and with finely chopped onions stirred through. Each mouthful felt like I’d been transported back to the Tuscan countryside. Next we visited Lupa, named after the mythical wolf goddess, our main here was the joyful simplicity of ricotta gnocchi. Plump dumplings that melted in my mouth like butter, were served with a simple but flavourful tomato and basil sugo (the carnivores were served the same pasta with a ragu of sausage and fennel). 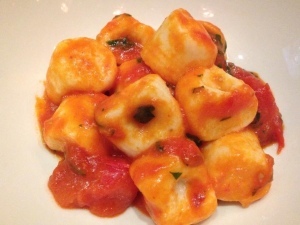 It was enough to encourage me to try my hand at making gnocchi again soon. To finish, of course we had to sample gelato. There are several gelateria’s in Greenwich Village, Walks of New York’s choice was Dolce Gelateria. Another family owned business that has been pleasing old and young for decades. Again their philosophy is to focus on seasonal produce with the icy treats made on site each day. 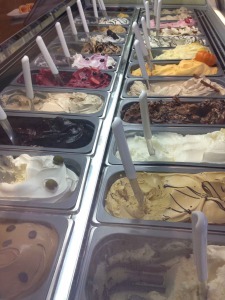 I sampled the olive oil gelato which was creamy with a pleasant hint of extra virgin olive oil in the aftertaste. For a second sampling I chose a tart and fruity passionfruit, that was simply fantastic. For me the tour was just the right length. After over 3 hours, I had learned so much about both this quiet village in the middle of bustling New York, had strolled through the Italian countryside, sampled rustic fare and was well and truly satiated. I’d highly recommend exploring this little piece of Italy in New York, my only tip would be to make sure you wear stretchy pants and come hungry. Like any visit with an Italian family, it’s impossible to leave without eating just a little more than you should! Note: This review is my own personal opinion, no payment was received for it.